This comprehensive resource covers every aspect of Lanham Act cases, from pre-filing considerations to disclosures and discovery, through motion practice, trial, and post-trial proceedings. You’ll also find analysis of alternative proceedings that may be used in trademark cases, including oppositions and cancellations in the TTAB; Uniform Domain-Name Dispute-Resolution Policy (UDRP) proceedings for domain names; ITC investigations; and alternative dispute resolution tools. 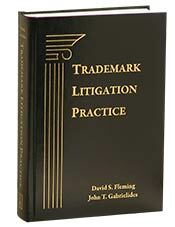 Trademark Litigation Practice covers all of these practical litigation topics in detail, with many topics presented in an easy-to-use, circuit-by-circuit format. It includes an index, case table, and appendices with examples of relevant local practice rules and forms. David S. Fleming is a shareholder in the Chicago office of the U.S. intellectual property firm of Brinks Gilson & Lione. He has litigated all types of trademark cases in federal courts throughout the United States, as well as in the TTAB and in UDRP proceedings. John T. Gabrielides is a shareholder in the Chicago office of the U.S. intellectual property firm of Brinks Gilson & Lione. He has litigated the full spectrum of Lanham Act cases in federal courts, including trials before juries and judges, as well as preliminary injunction proceedings.